The third book in the Red Ridge Pack series picks up right after the second one. If you haven't read the series, it's about a pack of werewolves with a bit of drama at the moment. The alpha has found out he has an elder son who happens to be mated to a human (not normal), and his other son is mated to a half-breed. Things seem to be falling apart and they find out another pack has plans to take advantage of their momentary weakness and attack them for their territory. This other pack attacks in a sneaky way - sending a few of its members, pretending to be friends, to mess with the heads of the leaders. Luke is one of these leaders, and he can't get the visiting werewolf (Scarlett) out of his head. She's a knock-out and she seems to like him too. But Scarlett may just be playing the game her pack sent her to play. Theirs is a very interesting relationship full of lies and deceit at first. This book had a lot of political intrigue between the alpha's two sons that Luke kept getting caught up in. Scarlett and Luke were both incredibly dynamic characters, and while we didn't see a whole lot of development from our previous books leads, they were there for the ride and were pivotal in moving the story forward. I love it when a book can keep characters from previous parts active in the storyline - we've grown to love them and want to see more. There is a lot going on in this one, with lots of crisises averted just for new ones to pop back up. With an ending that was very much a cliffhanger, we can only wait to see what will happen in the next book. Thanks so much for the awesome review! 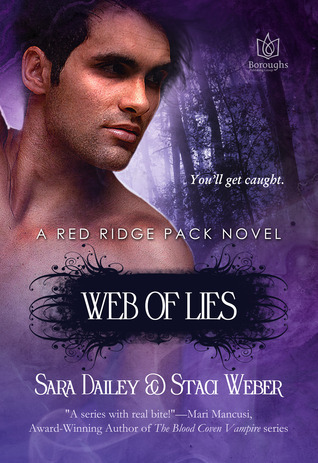 We are so excited about Web of Lies. We just finished the last book in the series, so be on the lookout for it sometime this spring!